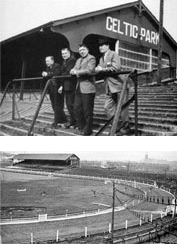 Park Centre is located on the former football ground and race track known as Celtic Park, home to Belfast Celtic from 1891 to 1949. The legendary Belfast Celtic Football Club was the leading light in Irish football from 1891 to 1949. Although twice forced to withdraw from competition due to the political upheavals of the time, the Belfast Celtic team won numerous trophies and gained the admiration of the sporting community in Ireland and further afield. During their time in competition, Belfast Celtic had won the Irish League fourteen times, the Irish Cup eight times, the City Cup ten times and the Gold Cup seven times. The Belfast Celtic team was the pride of Irish football until it was forced out of competition after the dramatic game against Belfast rivals Linfield on Boxing Day 1948.